When going to see a blockbuster animated film, especially those featuring anthropomorphic animals, one usually does not expect to be confronted with contentious current-day issues. Disney’s new animated feature “Zootopia” is able to broadcast lessons on prejudice while remaining a family-friendly film without being overly cloying or pandering. The plot of “Zootopia” parallels a standard buddy cop film. 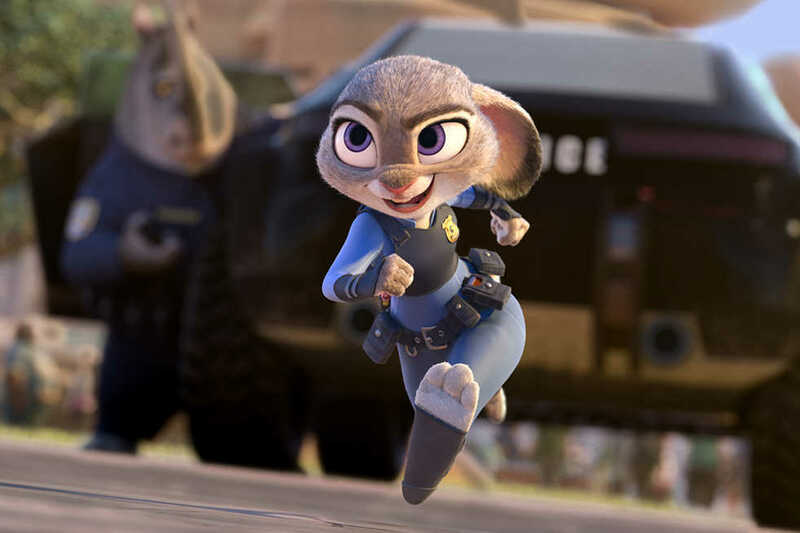 Optimistic rookie Judy Hopps, voiced by Ginnifer Goodwin (“Once Upon a Time,” “Something Borrowed”), has dreamed of being a Zootopia police officer since she was a young bunny in spite discouragement for those around her, especially her apprehensive, carrot farmer parents (Bonnie Hunt, “Jerry Maguire” and Don Lake “Dumb and Dumber To”). Zootopia is a futuristic city comprised of evolved mammals living together in harmony and has the tagline “In Zootopia, anyone can be anything,” a statement epithet Judy often repeats as an affirmation. As the first ever bunny police officer of Zootopia, the newly badged Officer Hopps strives to break preconceptions that smaller animals are unable to act as enforcing officers, but her idealistic beliefs are almost immediately squashed when she is assigned parking duty instead pursuing missing mammals with all the other officers in her precinct. She tries to prove her worth by personally taking on one of the cases against orders of her boss, Chief Bogo, voiced by Idris Elba (“Luther, “Beasts of No Nation”), and has a 48-hour deadline before she loses her job. She partners up with sly Nick Wilde (Jason Bateman, “Horrible Bosses 2,” “This is Where I Leave You”), a small-time con-artist who previously tricked the credulous bunny officer after she discovered that he had pertinent information to her missing Otter case. Together, they utilize their contrasting skills to crack the case of the missing animals while finding a happy medium between their overly optimistic and incredibly cynical personalities. The film is initially framed as an underdog narrative where a character aims to achieve a long-time dream, going from a small suburb to the big city. However, “Zootopia” ultimately touches down on deeper racial subtext about acceptance, prejudice and the language involved in the discussion the two. The themes hit American audiences hard in light of the national discussion on race and stereotypes post-Ferguson and the 2016 Oscars. Some of the dialogue in the film is eerily similar to the everyday conversation about racism. When lovable greeting desk cheetah Benjamin Clawhauser calls Judy cute, she awkwardly clarifies that “A bunny can call another bunny cute, but when another animal does it … .” Later, while fighting for better representation of smaller animals and discussing her case, Judy inadvertently casts fear into the hearts of the prey community and soon finds that prejudice may be more ingrained than she believed. Hopps then has to deal with the fallout from her words. The writers of the story leaned into audience’s preconceived characteristics about certain animals. While evolved, the inherent nature of each species remained the same — bunnies are easily frightened; foxes are sly; lemmings will follow each other. As audiences personally identify each animal with their associations, the message about preemptively drawing conclusions is flipped onto the audience when they realize that they were part of the group making generalizations about the animals in the film. While young audience members may not truly understand all the undertones, all of the overarching concepts were clear enough that even younger viewers would understand. The adaption of the animal world is incredibly creative and beautifully rendered. In a behind the scenes presentation of “Zootopia” at Tech, Environment Supervisor Lance Summers noted that the production designers intended for the setting to be futuristic and more organic-looking as animals constructed them. There are six key environments: Sahara Square, Tundratown, The Rain Forest District, Bunnyburrow, Savanna Central and Little Rodentia. All animals are accommodated in the city, from the largest giraffe to the smallest shrew, with a hodgepodge of doors, tunnels and gizmos to serve each and every type of animal. Finding how certain types of animals are adapted or their environments are incorporated is almost like a game, much like the introduction scene of foodimals in “Cloudy with a Chance of Meatballs 2.” There are so many small details to catch. Pun lovers will enjoy the animal names of stores such as “Zuber” and “Yakgurt.” While the puns are not as in your face as “Cloudy 2,” many of the jokes are predictable and follow common tropes such as tougher characters having an unexpected softer side. However, this can be easily overlooked as the delivery of the jokes are well-executed. Summers noted during his presentation that Chief Creative Officer John Lasseter was highly involved with the now famous DMV sloth scene to ensure that each joke landed. Audiences laughed hard at the scene during both the movie and the presentation in spite of the fact that the scene was already circulated as teaser from the movie. The many easter eggs in “Zootopia” are more blatant than in previous Disney films, which almost the entire audience recognizing them immediately. Still, Some subtle ones are harder to notice. Summers pointed out the snowflake centerpiece in Tundratown is a direct artifact of Arendelle, complete with little elephants dressed as Elsa and Ana next to it. Additionally, Alan Tudyk may now be Disney’s version John Ratzenberger. Allusions were not limited to previous Disney films, but quite a few pop culture references such as the shrew taking the guise of the godfather. While the kid-friendly tag “anyone can be anything” is pretty obvious, the true takeaway from this film is audience may learn to imagine each other a bit more complexly.